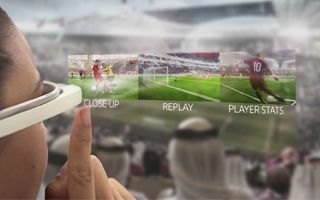 Qatar 2022: Can holograms enhance matchday experience? Four Qatari students are among winners of the nationwide Challenge 22 competition, aimed at providing worthy innovations for the 2022 World Cup in Qatar. Ali El Dous, Khaled Mohamed and Taofik Al Nass are all computer science students, while Salman Badnava studies electrical engineering. Together they proposed the introduction of hologram glasses that might enhance spectator experience at the stadium. This means, among other possibilities, the chance to see live stats on particular players, learn more about each of them, play close-up or replay clips almost instantly. In short (and perhaps not doing justice to the idea) one can say it’s very much like an evolution of products already out there, like Google Glass (whose rendering we used to try and show how it might look). Before we find out what actual features the product may include, a lot of hard work has to be done in Qatar. The four students were granted funding and support from the Qatar Science and Technology Park (QSTP) to develop a prototype of their final high-tech glasses.